How many times have you heard that breakfast is the most important meal of the day? A million times since you were a kid, right? I’ve never been much of a breakfast person. I can’t really eat first thing in the morning. My stomach just will not accept food when I first get up. It amazes me to know that some people roll out of bed, shuffle into their kitchens, and start eating. My routine is, I go to work, have a cup of coffee, and right around 10:30 or so, I’m ready to eat a little something. I know that’s not a great way to start my day, but it’s the best I can do. 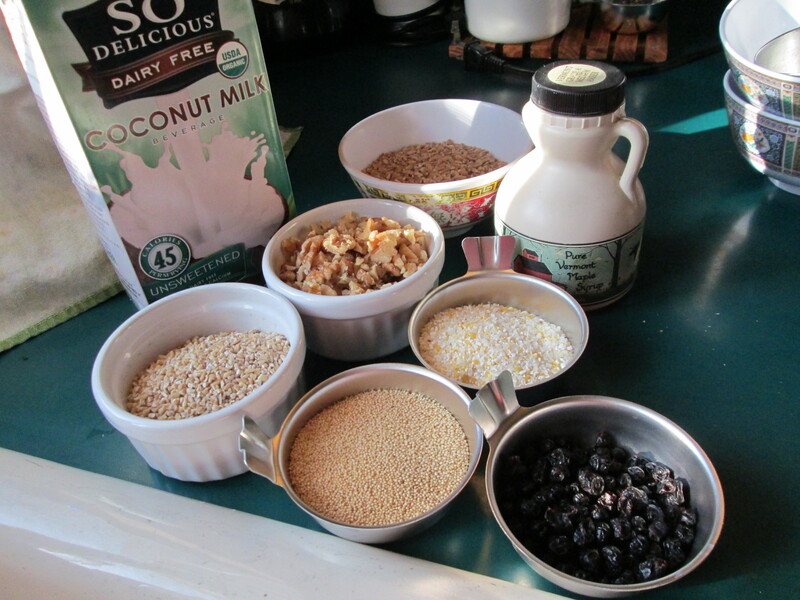 Breakfast porridges are a great choice and can be made with any grain you like, such as steel-cut oats, quinoa, millet, and barley. Below is my recipe for multi-grain porridge. 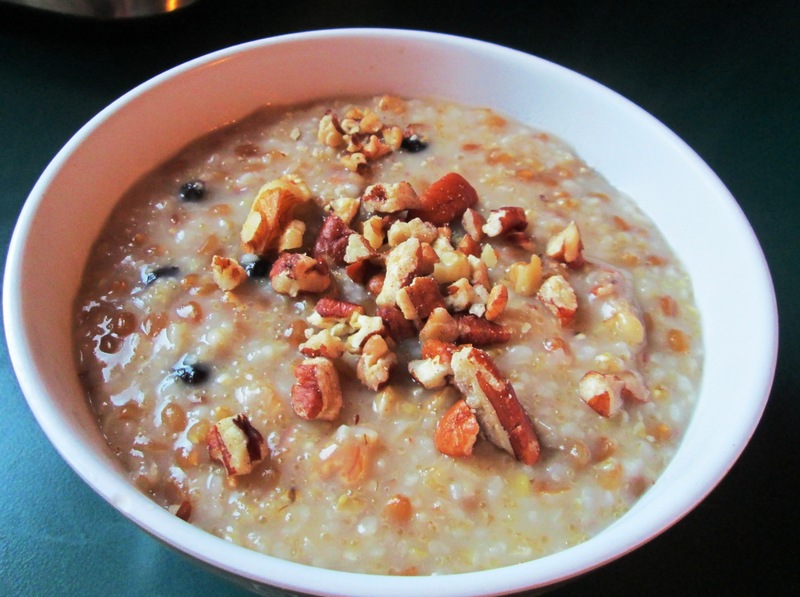 I had the original recipe for this porridge in my collection for a while but never gave it a try. Not because it didn’t appeal to me (otherwise, I wouldn’t have clipped it), but because I so rarely make homemade porridge for breakfast. During the week, I never eat breakfast at home—I prepare whatever it is I’m going to have the night before and take it to work. On the weekends, I still don’t have time and usually just grab leftovers from the fridge. But whenever I can, I’ll make some kind of porridge. I made some modifications to the recipe, based on what I had on hand and my personal preferences. The good thing is that this stays well in the fridge for a few days, so I can make a big batch and just reheat it. 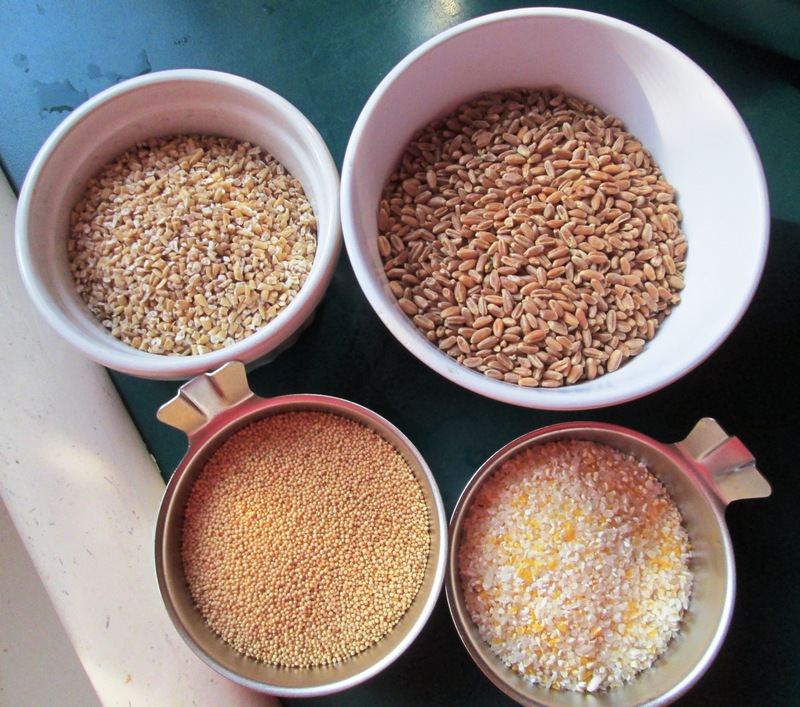 Clockwise from upper right: Wheat berries, grits, amaranth, oats. Bring 5 cups water to a boil. Add the wheat berries and salt; reduce the heat to medium-low and simmer, partially covered until almost tender, 20 to 30 minutes. Add the oats, grits, and amaranth and stir. 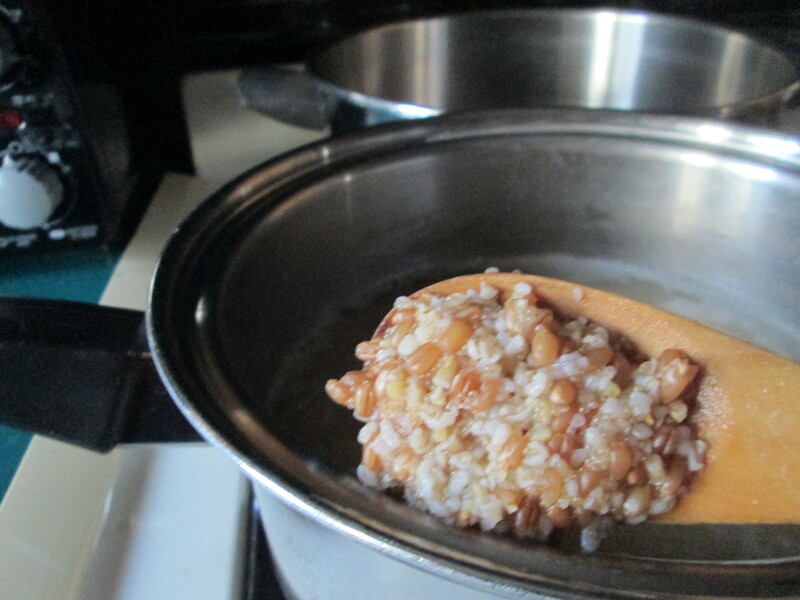 Continue simmering until all grains are tender, about 15 minutes, stirring frequently. Stir in coconut milk, maple syrup, and fruit and cook another 2 minutes, stirring frequently. Stir in nuts. Serve hot. This porridge will keep for several days in the refrigerator. To reheat, stir in a little more coconut milk or water until it reaches the desired consistency. Heat over medium-low heat or in the microwave for 1 to 2 minutes. Categories: Breakfast, Healthy Alternatives, Healthy eating, Uncategorized, Vegan, Vegetarian | Tags: amaranth, breakfast, grits, multigrain, oats, porridge, wheat berries | Permalink. I love oatmeal- it’s my ideal breakfast! I also love adding flax seeds to my oatmeal. Growing up, my mom always started her day with a cup of hot water with lemon and honey, and I’ve slowly adopted the habit. It’s a great way to slowly wake up your digestive system if you don’t feel like eating just yet. Smoothies are great, too! Nothing like a good ole beet, ginger, and apple juice. I’ve heard people doing the hot water and lemon thing. Sounds like a great plan. Maybe I’ll give it a try. Thanks for the tip, Genevieve!